Andrea. 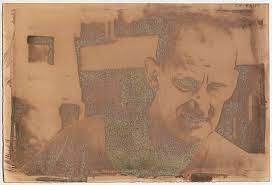 Cynotype posterized by tea toning and sodium carbonate. Fabriano Artistico Paper gelatine sized, salted and pre-acidified in citric and acetic acid. Paper and image size: 19x28,5 cm. Unique print. It is known and decanted the importance of taking notes and conform to standard all the procedures when working in dark room, mostly when working with antique techniques. But sometimes it is funny to let yourself go and dare. The majority of the prints will be thrown away, but sometime you can get unique results that you would have never been able to obtain if following the known ways. Something you’ve never seen before, because it is born with the help of destiny. This is the history of one of those images. Couple of years ago, far 2004/2005, I was fighting with salted paper, and I couldn’t print more than a pair of decent images. I couldn’t understand which was the variable that stonewalled. I was testing several types of paper, sizing, hardening… I found the right combination for a great result, I prepared 20 sheets with as much attention as I could, but in the end no one was working. There must be some kind of variable that I couldn’t control that was making fun of me. The result was nothing but tons of lost hours and lots of paper ready to be sensitized and left in the dark room to get older. Today I accidentally found a folder with thirty of those sized and salted papers. Arche Acquarelle, Fabriano Artistico, Rives BFK. Each one had a different concentration of gelatine, a different hardening, a different quantity of salt. All of those paper where mixed together, discards and failings who were waiting to be used. I say this is the good occasion to play with some cyanotypes. I lay my sheets to dry, sensitize with classic cyan, 0.8+0.8 for two on 18×28. I sweep the brush without even trace the borders with the pencil, desiccation with warm dryer (I never do it, but who cares, I’m playing!). I don’t measure the time of drying (Usually I use 10’ between the first and the second coating and 30’ before the exposition). Under UV for, I don’t know, 15 minutes? Digital negative for Van Dyke, then too much contrasted, but who cares, I’m playing, ain’t I? The image is quite beautiful when getting out of the printing frame. It’s strange. It generally seems grayer… I put it on the acid water and suddenly it turns into deep blue, I’ve never seen something so quick. Suddenly though, blue filaments fill the water and the image is completely cancelled. Bright lights completely burnt, a few shadows almost closed. What a pity, this paper was nice and thin. 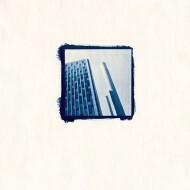 Probably gelatine doesn’t let cyanotype to attach paper and it’s completely washed away. I made some more prints with some drops of wetting agent to augment the penetration, but I obtain bad results. At the end of the afternoon I have a series of awful cyanotypes. What I was expecting? Working with precision is a rule that worth the while. Fantasy and game don’t bring any result. Proust said that big works starts while bored, not inspired. Who knows if he was a dark room lover? I prepare a tea bought at the supermarket, 5 tea bag for a smoking teapot. 12g of carbonate and 600ml of water. Tea is boiling, but who cares? 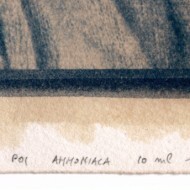 I put the first image inside, an old Fabriano Artistico that quickly turn into tea color. I leave it there, but I don’t take care of time. It doesn’t matter; I just want to see if it has the same pink I get with bleach. Some minutes of washing and then carbonate. The image suddenly changes, turning into red brick in a few seconds. I then see something strange and magnificent, the image is negative. I put it into water, dazed. Toning took from 2 to 10 second; shadows are posterized and brighter than the middle grays. Lights are red brick colored. I wash everything for a few minutes and put it to dry, hoping it doesn’t change. 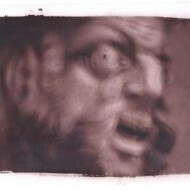 Meanwhile, I try to tone a dozen of cyanotypes, but I absolutely do not obtain the result I got before. The print only has 4 tones. Everything from the middle tones is red-bricked. Something over an intense brown, such as some middle of the Van Dyke Brown. Shadows are divided in two. There’s a part which is less intense, it is white green with lot of brown. The other part is white-light blue with brown again. The fact that they’re posterized with a brighter color makes the image a mixture of positive and negative. Tea tone gives somehow an antique and scrambled aspect. I should dig in the salted paper of a couple of years ago and in all the casualties that I met today. Scanning doesn’t give the idea at all, it’s a unique print and I will hold it tight. questo è probabilmente l’esempio più emblematico della labirintica complessità di queste tecniche. la stampa è davvero molto bella e surreale. capisco cosa intendi quando dici che va tenuta in mano.